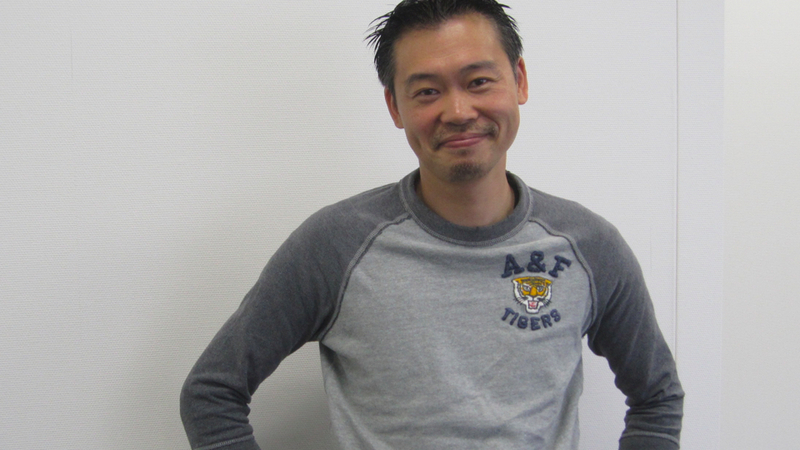 In just a few minutes Keiji Inafune will take to the PAX stage. 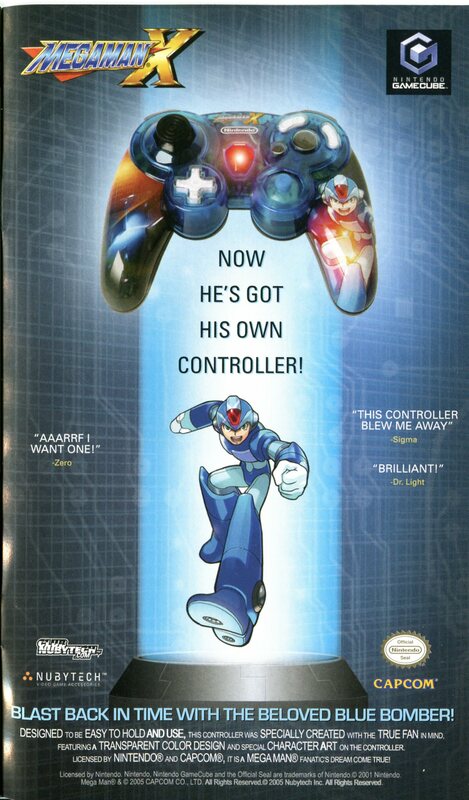 Though he's no longer working for Capcom, we can probably expect him to talk a little bit about Mega Man (and then some). It's bound to be interesting. Embed not working? Direct stream here. Every so often Rockman Xover's servers spring a leak and clue us in on future updates. Tonight is no different: here we have a sneak peek of the upcoming "OVER-B" form. If it wasn't clear enough, this one is based on Blues' Rockman EXE incarnation, complete with (what looks to be) an arm-mounted beam saber. 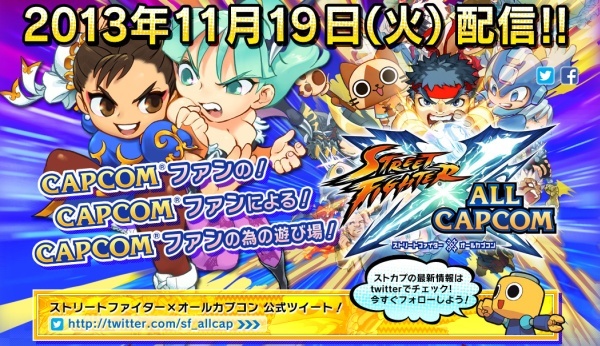 Other Xover leaks seem to suggest a Star Force 3-themed world (which would accompany OVER-B), a new collaboration with Eagle Talon, and a "special" Roll Caskett swimsuit card. I've included that one after the break. It's not particularly work appropriate. Thanks for the updates, Django! 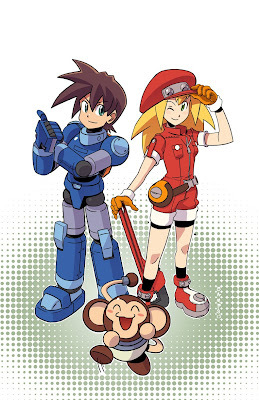 Yet more Mega Man Legends love from the Archie Comics Mega Man team. This time it's from Harvey Award nominee Ryan Jampole. This is Ryan's first time doodling Mega Man Volnutt, Roll Caskett (in her Legends 3 wear, no less) and Data, though hopefully not the last. I think there's plenty among us still yearning for Archie to tackle Legends! 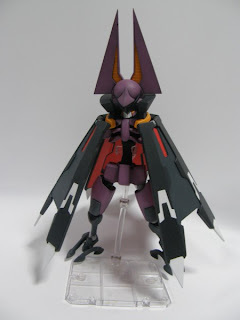 When Kotobukiya doesn't deliver, fans are more than willing to pick up the slack. That seems to be the message being delivered loud and clear with a pair of truly fantastic model kits of Devilbat Schilt (Hellbat to our friends in Europe and Japan) and Childre Inatabitta. 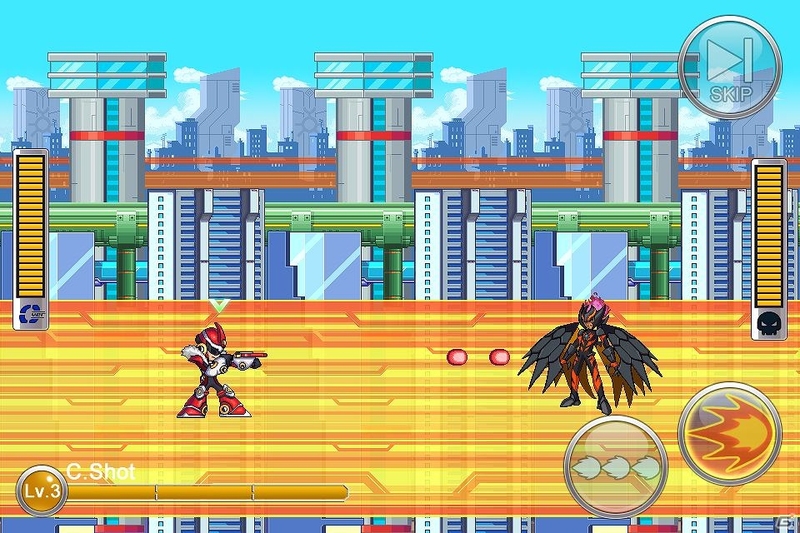 These bad boys hail from Mega Man Zero 3's Eight Gentle Judges, aka "Weil's Numbers." Pretty authentic, wouldn't you say? Both kits made their debut at the Summer Wonder Festival a short while back, but it looks like you can't grab them so easily. Yahoo! Auctions Japan is a good place to start (bring some dough). Nevertheless, there's plenty of photos to admire of both kits on FG. Hit the links above for more! 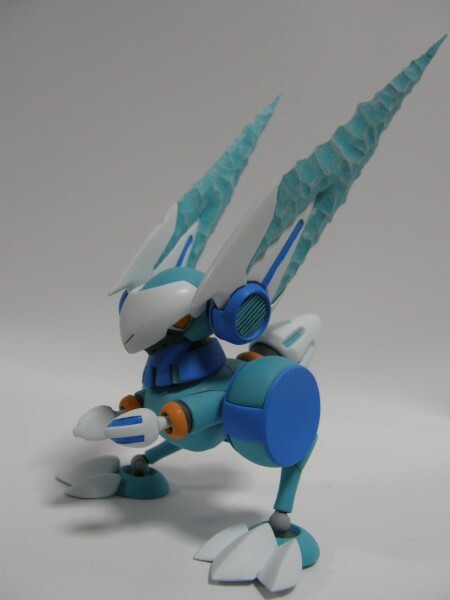 It's stuff like this that really makes me wish Kotobukiya continued their Mega Man Zero line. Zero series aesthetics look great in plastic, after all. By way of Amazon UK, here's a sneak peek of Mega Man's profile from the upcoming Capcom Character Encyclopedia. Everything looks to be in order... except that "last appearance" tidbit. 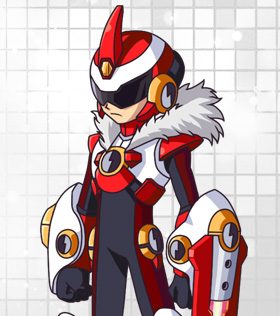 Classic Mega Man didn't appear in Project X Zone (that honor went to Mega Man X). It's a minor error, one that could easily be recified before the book hits the printers. Let's just hope someone from Brady Games is reading this post! The Capcom Character Encyclopedia is due out this October. 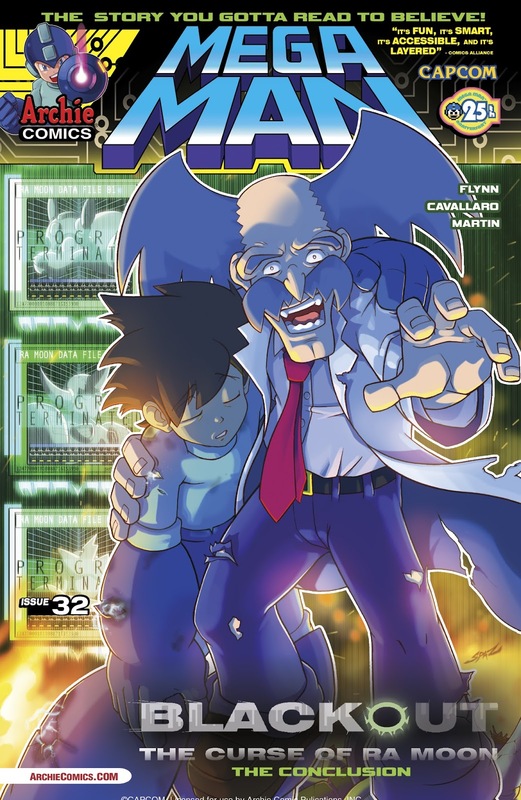 It's 208-pages in length, so we can probably expect a few more Mega Man-related profiles in there somewhere. Those interested can preorder it from Amazon and Barnes & Noble for the discount price of $10.19 US. If you’re one of the lucky people headed to PAX Prime 2013, you're in for a little treat. 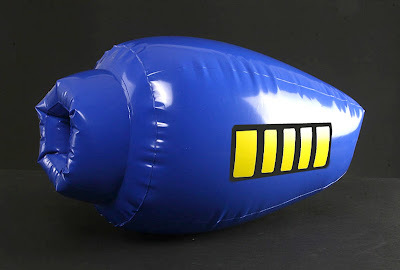 Capcom has graciously donated a whole batch of inflatable Mega Busters and 25th anniversary pins to be handed out for free during the Friday night Mega Man concerts. Better yet, a very, very limited number of people will walk away with a free classic Mega Man 25th anniversary statue. Just make sure you show up before 8:30pm. There's going to be quite the crowd, after all. 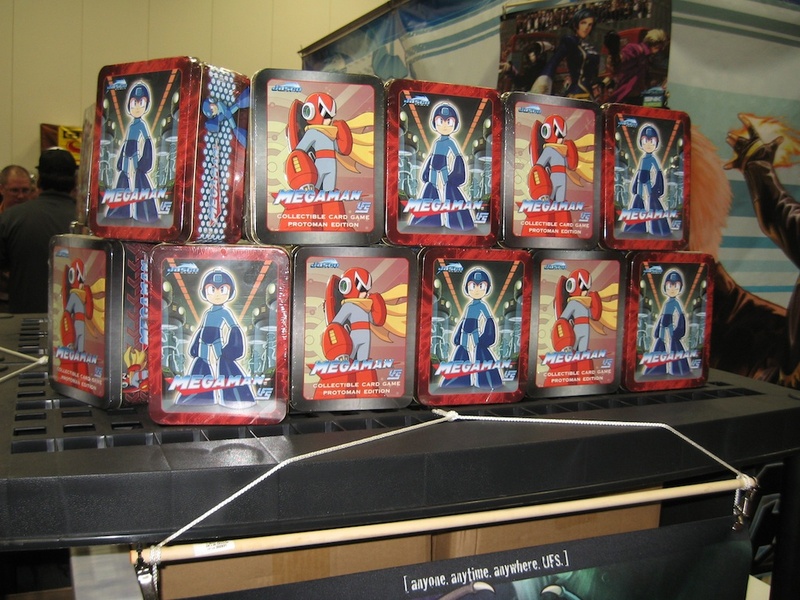 Care to sneak a peek at what's inside the Proto Man Universal Fighting System tin? A one Syclic managed to scan the entire set following Gen Con, viewable at this Imgur gallery here. What's more, he's taken the liberty of cataloging everything there is, card by card (character, attacks, foundations). Read on for the complete list. Custom hardware/accessory genius PlatinumFungi is back. 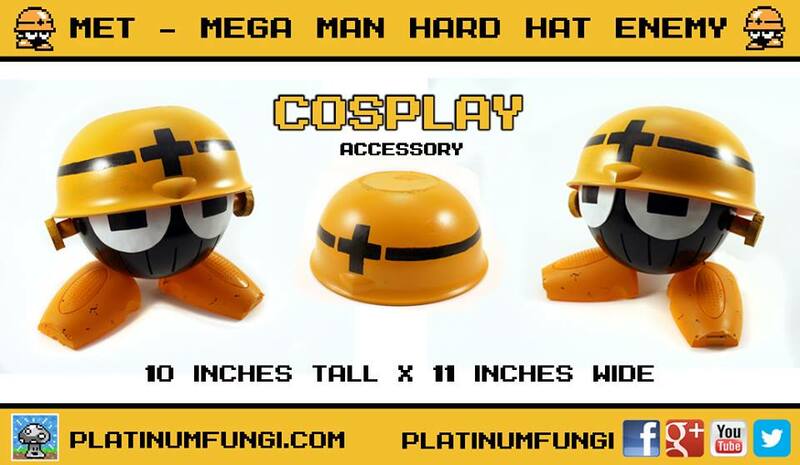 Following up on his custom 25th Anniversary backlit NES, PlatinumFungi has created a near-life-size Met (aka Mettool, Mettal, Hard-Hart) for Mega Man cosplayers. It clocks in at 10-inches tall, 11-inches wide. "This particular build has a removable hard hat so you can have the robot in either pose," writes PlatinumFungi. "If/when I build version 2.0 I would like to have it actually shoot something, probably ping pong balls, and maybe even pop up. We’ll see." To find out a bit more on the process that went into the little guy, hit up this post. I'm not a cosplayer, but I certainly wouldn't mind having one of these around the house! Here's a bit of news I know many of you have been waiting for -- the Mega Man Nintendo 3DS and 3DS XL cases are now up for preorder on the Capcom Store! Both versions are anticipated to ship in early September, priced at $15.95 (3DS) and $19.95 (XL) respectively. It would appear stock is limited, so I'd get your preorder in before they run out. Either that or fork over some serious Zenny on eBay. I can't believe how much these are going for on the second hand market! 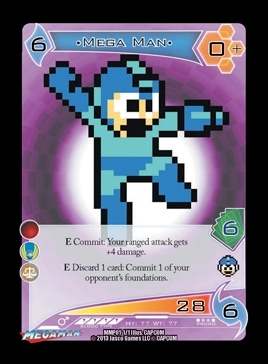 From now until August 25th, DriveThru are selling a promo Universal Fighting System Mega Man trading card for no less than one dollar. No, I lied; it's actually three dollars including shipping (if you're in North America, that is). Anywho, this will be the first card available to the general public. 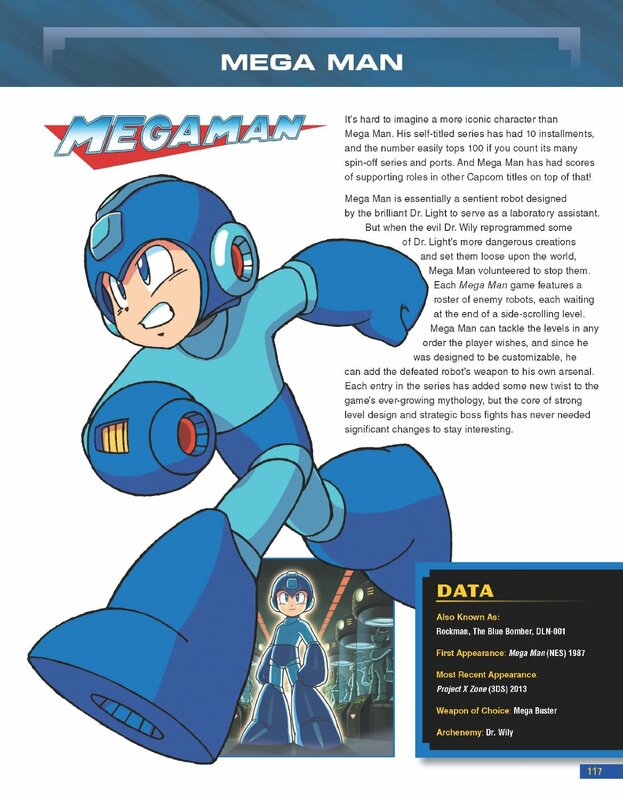 It features Mega Man in his 8-bit incarnation with stats taken straight from the upcoming Mega Man UFS set. It's three bucks so if you want to see what all the hubbub is about, grab it while you can. Thanks to Boco and Steev for the tip! For the uninitiated, Nanoblocks are a bit like LEGOs, but they're a tad shorter. 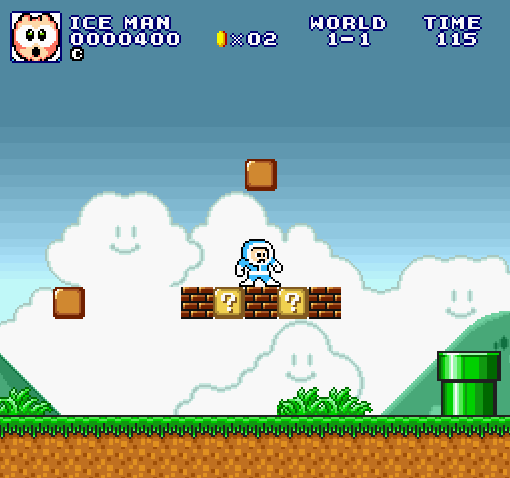 In addition to Mega Man and Cut Man, each set is accompanied with just enough parts to make additional items and stage enemies. The Mega Man set includes the pieces to build an E-Tank, a large energy pellet, and a large weapon energy capsule. The Cut Man set features a removable Rolling Cutter and three enemies (Octopus Battery, Blader, and Screw Bomber). Both sets are planned to release in late October. If you like what you see, hit up the the links above and preorder! 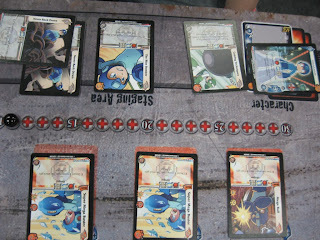 Now that Gencon's done for the day, Boco brings us some additional details on Jasco's Mega Man board game. Mind, the Jasco people are bound to an NDA so there's still quite a few things they were unable to share at this time. Nevertheless, we've got a nice chunk of info (plus Kickstarter clarification) and a couple images to share. Read on for the lowdown! 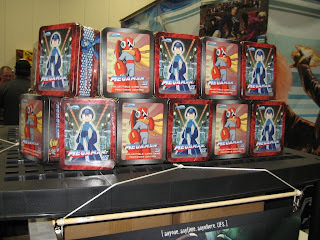 "The UFS tins will have the starter deck, three boosters, three Robot Master promo character cards, and a poster/playmat, and will be $30. Out in October I think? I’ve never played UFS so you’ll have to ask someone else for mechanics. But the cards look very nice, with art from the Archie comics. Those vinyl playmats are also pretty killer and I might pick up the one with all the RMs on it." If you're interested, hit up Boco's Tumblr for more images of the cards, tins and collectible playmat. 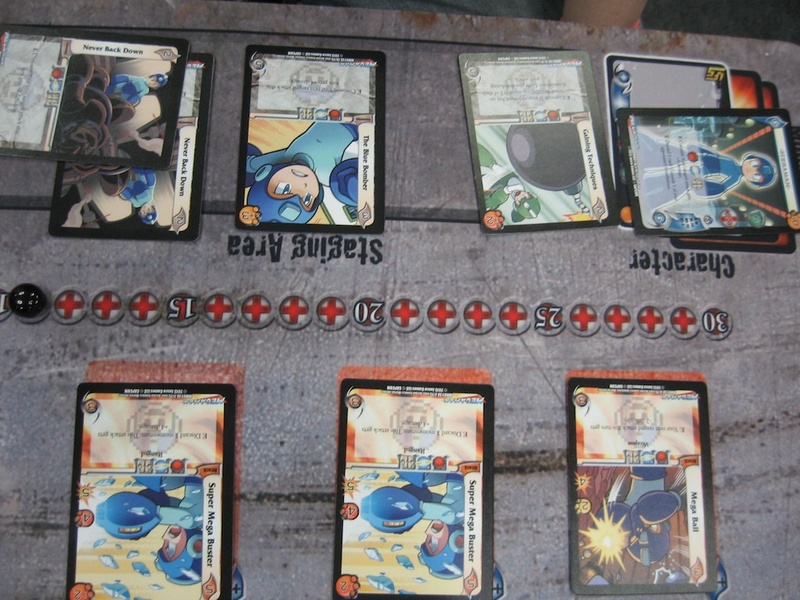 Now, as for Jasco's other Mega Man product, the official board game, we've got some preliminary news to share too. Read on for the lowdown. Capcom has confirmed the existence of the rumored "Capcom Essentials" bundle, a 5-in-1 package that includes Devil May Cry 4, Resident Evil 6, Dead Rising 2, Super Street Fighter IV, and Mega Man 10. Every game but Mega Man 10 ships on a disc.... that one is reportedly coming as a download code. Look above, it's the voucher on the far right. So yeah, bit of a bummer. We knew the game wouldn't have its own disc, but I believe most of us were banking on the idea of it sharing a disc alongside another game. 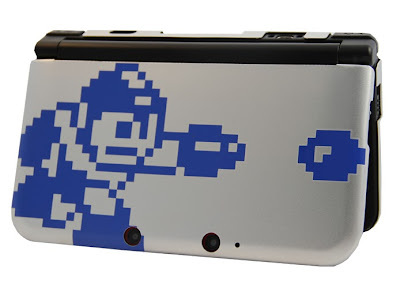 That way, collector's would have some physical representation of MM10 for the shelf. Oh well. Disc or no disc, it's still a decent set. And hey, it even comes with a nifty Capcom travel bag. You know, for traveling. The whole kit and kaboodle is due on October 8th for $59.99 US. BC Direct is back again after a long absence from the customizing community with a brand new Capsule commission. 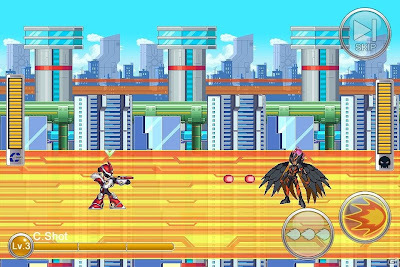 Just like before, this one is designed for Bandai's D-Arts Mega Man X. "Something was always off with my previous designs; I noticed it, fans DEFINITELY noticed it," he writes. "This is my closest attempt to the gamer version thus far." Pictured above is the new model (colloquially dubbed "Commission Capsule Mark IV"). 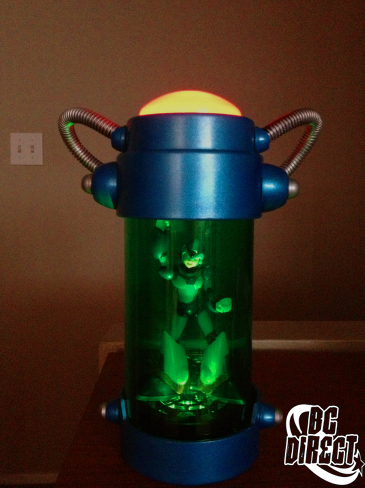 It features sturdier plastic and a light-up base and dome piece. Not one to keep it to himself, BC is taking commissions. "I stopped making them last year and it seems when I stopped everyone started inquiring about them. I must have told 50 people that I was no longer making them." He adds, "Well they're back, they're more accurate, and they're fully customizable from tube color, to capsule color." 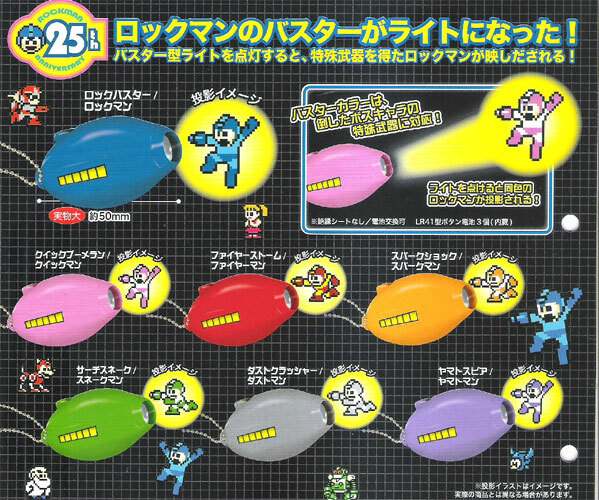 Rock Buster Light-up Keychains, Because Why Not? 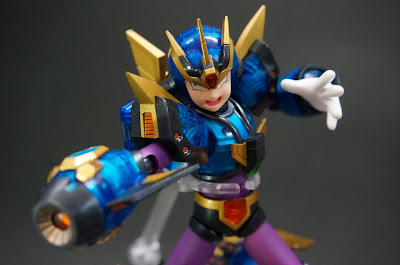 System Service's quest to flood the gashapon market with Rockman trinkets continues! What we have here are a set of Rock Buster keychains that... well, c'mon; the image above pretty much speaks for itself. Simply press a little button and the mini-flashlight projects one of seven Rockman sprites. Colors are based on Robot Master power-ups, of course. As per usual, these are prizes intended to be available in crane games and capsule machines in Japan later this fall. Online vendors like Big Bad Toystore and NCSX tend to load up on System Service goods, so we might find them there too. 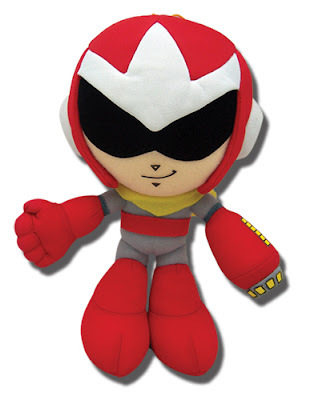 Here's a quick bit of news courtesy of the Video Game Memorabilia Museum: It would appear NCSX are now accepting preorders for the Rockman figure straps. 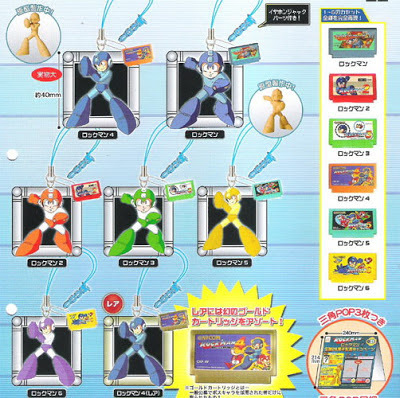 These are phone straps that feature a color variant Rockman figure accompanied by a miniature Famicom cartridge. There is also a rare gold cartridge variant based on the Rockman 4 boss contest commemorative prize. Each figure is around an inch and a half tall and comes in one of two poses. Take note, NCSX are selling a box of fifty straps. The figures within are entirely random, so there's no telling which flavor you'll get. If you'd like to try your luck, the set will run you $29.90 US. "Finally colored a doodle from ages ago. 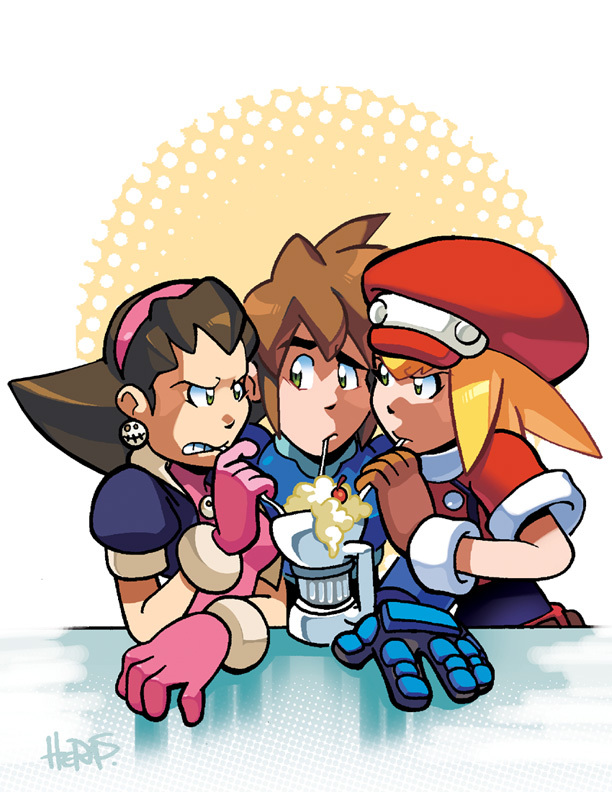 Mega Man, Roll, and Tron (from Mega Man Legends), inspired by the iconic image of Archie sharing a milkshake with Betty and Veronica... Which, shockingly, I don't actually know who drew the original of that, though it's been re-done tons of times since. Anyhow, Legends is my favorite MM spin-off, next to X. They're not flawless games and they haven't aged as well as others, but they're incredibly charming with some great characters, designs and style. Maybe someday, hopefully, Legends 3 will get another chance to be made. Pencils and inks on cardstock, Photoshop 7 for colors. Hope ya' dig!" An Archie adaption of Mega Man Legends isn't in the cards at this time, but it's something I, for one, wouldn't mind seeing. Matt Herms is more than welcome aboard! It's been a little while since we last heard from Jasco's Mega Man board game and Universal Fighting System trading card deck. Soon, however, we'll be learning (and seeing) a whole lot more. A source close to Jasco informs me that both the board game and the UFS Mega Man deck will make their grand debut at Gen Con 2013, which kicks off on August 15th at the Indiana Convention Center. Both games will be on-hand to check out for convention goers, and there should be a decent amount of images and related media for those of us who can't make the trip. Of course I'll keep you informed on the details as well. For the Mac owners out there, you can now directly run Mega Man Unlimited in OS X thanks to the generous porting efforts of OneWeakness. Now you too can enjoy the bliss of dying over and over again! Yeah, MMU can be pretty hard. Which brings us to another tidbit of news: MegaPhilX is currently working on a brand new Easy mode that will appear in a future balance update. 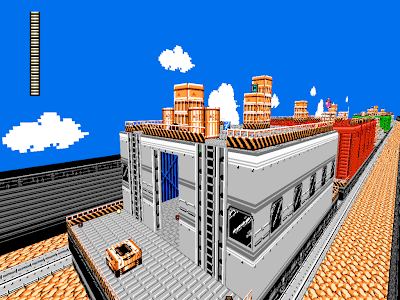 Taking a page from Mega Man 10, this new mode will add safety blocks over some pits and spikes, add extra checkpoints in the castle Stages, and adjust the speed of certain obstacles (like those crazy lasers Rainbow Man's stage). For those who like the difficulty as is, the update will also bring a new challenge in the form of a one-hit death mode. Ooh la la! Update: The easy mode update has arrived. That was fast, no? Grab it here! Everyone’s favorite nostalgic video game mash-up is back, and it plays better than ever! Super Mario Bros. Crossover 3.0 is here, adding more characters, stages, costumes, and difficulty levels to the core experience. 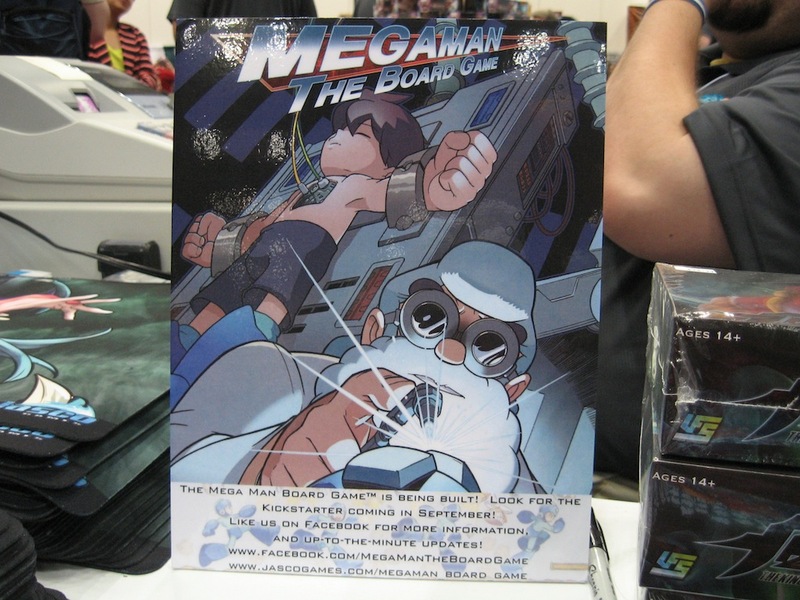 There's plenty of Mega Man love to be had, of course. Ever wanted to play through World 1-1 as Ice Man with the graphics of Super Mario All-Stars? Now you can. The game is available for free on Exploding Rabbit's website. Check it out if you haven’t already.